Downtown Marshalltown prior to clean up. 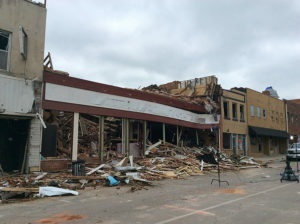 The damage in Marshalltown from last month’s EF-3 twister is so severe, the U.S. Small Business Administration is now staffing an office in the central Iowa city to process loans to rebuild. The loans are through the federal government, he adds, not a bank. The federal disaster declaration for Marshall County makes SBA assistance available to people in the surrounding counties as well: Grundy, Hardin, Jasper, Poweshiek, Story and Tama. “We’re in Marshalltown probably for the next couple of weeks so folks can come in and talk to a customer service representative, find out whatever information they’d like to and actually make an application while they’re here to see us,” he says. The National Weather Service says 13 tornadoes hit Iowa that day, but only Marshalltown was hit with an EF-3, with winds of up to 144 miles-an-hour. Around 90 homes in Marshalltown were destroyed in the twister, more than 600 were damaged. The SBA’s Disaster Loan Outreach Center is in the Fisher Community Center at 709 South Center Street in Marshalltown. It’s open Monday through Friday, 8 a.m. to 5 p.m.
Iowans can also apply online by downloading applications at https://disasterloan.sba.gov/ela, or call 800-659-2955.